Over the past couple of months we have given our customers the opportunity to tell us about their experiences. To do this, we have partnered up with Feefo, The Global Feedback Engine. We are happy to say that our service level is at 98%. 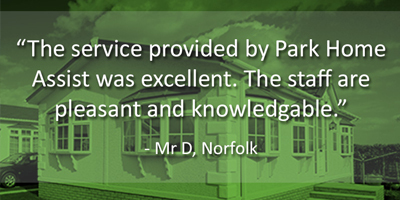 We are extremely happy to see that our customers appreciate the knowledge we have on Park Homes as well as our high standards of customer service. Feefo is a vital tool for Park Home Assist as it gives us a clear indication of what we are doing right and what we need to make stronger. We look forward to seeing your feedback and would like to thank all of you who have taken the time to do so. We also receive feedback in many other ways. This particular bit of feedback was obtained after a customer insisted in speaking to management to express his pleasure in dealing with one of advisors, Laura Cowell. “Re: My telephone call with Laura. I found your employee to be very efficient and very helpful in explaining what I needed to know. I then proceeded to take out my policy with you and I shall be recommending my friends at Oaklands Park to do business with you. Please thank Laura for being so helpful.